Smiths Grove is now home to the first Schlotzsky’s store in south central Kentucky. Crossroads IGA – which features Cinnabon baked goods, Carvel ice cream and Schlotzsky’s Bakery & Cafe – officially opened Wednesday at 619 S. Main St. in Smiths Grove. The building stands where the Shell gas station was – and fuel is still available on the premises. Dog food, charcoal, soft drinks, motor oil, chilled tuna sandwiches and jars of pickled eggs stock the shelves in the 11,000-square-foot facility. A specialty coffee and hot beverage bar and customizable fountain and frozen beverage bar stand near the cafe. Lifelong Smiths Grove resident Ruby Woods attended an open house Tuesday evening where she had her first taste of Cinnabon. Woods attended the grand opening Wednesday and left with a box of Cinnabon cinnamon rolls she purchased. Woods said she’s excited about the options the store gives Smiths Grove. The store is the fifth Crossroads IGA Houchens Industries has opened in the Bowling Green-Warren County market and the 10th in Kentucky. Houchens Industries recently opened another store in Louisville. The new Crossroads IGA employs 57 people, 12 of whom were prior employees of Shell and IGA in Smiths Grove. The employment opportunities and additional grocery and convenience store products will benefit everyone in town, Woods said. “This is the biggest thing to happen to Smiths Grove in years,” Woods said. Brandon Jones, spokesman for Houchens Industries, is also a Smiths Grove resident, so the new Crossroads IGA is special to him. People at the grand opening could spin a wheel set up in front of the cafe for prizes, including food and discounts. Cupcakes were also available for the crowd of about 40 people to celebrate the event. Mark Meers, chief marketing officer for Schlotzsky’s, said the Smiths Grove Crossroads IGA is the first of several partner projects the company will have with Houchens Industries. The store’s proximity to the interstate will likely draw many truckers and travelers, Meers said. “We want to be a dedicated stop along the way for (travelers) to get a great Schlotzsky’s meal while visiting Smiths Grove,” Meers said. Meers said Schlotzsky’s is trying a new rewards program at the Smiths Grove store. Lotz4Me is a mobile app that allows customers to get $7 off their purchase after their seventh $6-minimum purchase. Schlotzsky’s also caters and delivers. Smtihs Grove Mayor Bert Higginbotham said he was thrilled with the store, especially since he found Edy’s sugar-free ice cream, which he often has trouble finding. Crossroads IGA is in a great location for highway traffic, he said, and the people of Smiths Grove are happy to have another food and grocery option close to home. “I’m tickled with this,” Higginbotham said. Various public officials attended the opening, including Bowling Green Mayor Bruce Wilkerson, Warren County Judge-Executive Mike Buchanon, state Rep. Jody Richards, D-Bowling Green, Warren County Attorney Amy Milliken, state Sen. Mike Wilson, R-Bowling Green, and state Rep. Jim DeCesare, R-Bowling Green. Tim Sturgill, division manager for Houchens Industries, said he’s looking forward to the future of Smiths Grove’s Crossroads IGA. “I think you’re going to be proud of what we’re going to do for you here in Smiths Grove,” Sturgill said. Crossroads IGA is open daily from 5 a.m. to midnight. Houchens Industries will open an all-new Crossroads IGA in Smiths Grove Wednesday, July 16, which will feature Schlotzsky’s, Cinnabon and Carvel Ice Cream inside the grocery store. The Schlotzsky’s will be a full-service restaurant that will provide sandwiches, pizzas, flatbreads, salads and soups, along with fresh-baked treats from Cinnabon and Carvel soft-serve ice cream. The new store, located at 619 S. Main Street, is a unique neighborhood grocery store featuring an extensive selection of essential grocery items including top quality meats and fresh fruits and vegetables, plus on-the-go meal solutions. A ribbon cutting will be held at 11am on July 16. The first 100 to purchase a Cinnabon 6-Pack receive free Schlotzsky’s for a year. The tables reveal that some signature dishes came close to our readers’ benchmarks for excellence. But many of the biggest names earned significantly lower scores for the foods that made them famous, notably McDonald’s. The chain, which serves flash-frozen patties made with 100 percent USDA-inspected beef, touts them as free from “preservatives, fillers, extenders, and so-called pink slime.” Such a pledge might be comforting, but it’s hardly a rousing endorsement. McDonald’s own customers ranked its burgers significantly worse than those of 20 competitors, including Hardee’s, White Castle, and Carl’s Jr. No other house specialty scored as low. 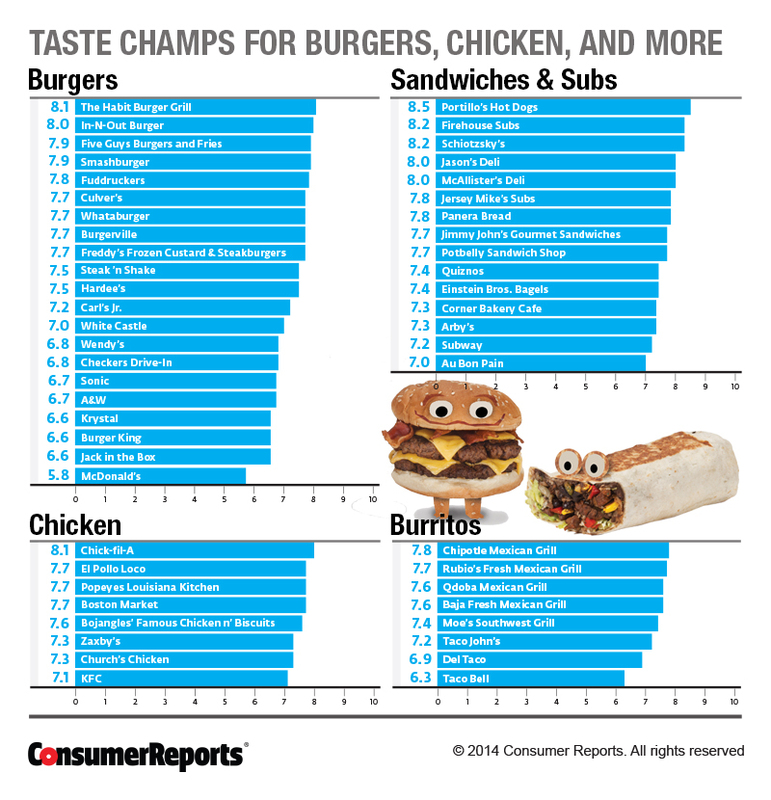 Taco Bell’s burritos were also voted least luscious. And the subs from Subway, the world’s largest restaurant chain with more than 40,000 units in 106 countries, are near the bottom of the list. Fast-casual restaurants are a step up from fast food (Chipotle describes its fare as “farm to face”). They usually serve higher-quality fare, charge higher menu prices, and focus more on a dine-in rather than drive-through experience. And they’re big on breakfast. The ones listed were among the most praiseworthy. McAlister’s Deli gets the award for most improved. The chain’s score increased significantly since our 2011 report. Here are the restaurants at the top of the list. Schlotzsky’s AND Cinnabon are coming to Elgin, TX! Grand opening celebrations kick off on Thursday, June 5. The doors open at 10am followed with games, prizes and more. The first 100 people to purchase a Cinnabon 6-Pack will get FREE Schlotzsky’s every week for a year! One of the hottest trends sweeping restaurants is artisan flatbreads. While similar in appearance to a pizza, flatbread is made without yeast with the dough rolled very thin and baked crispy. Schlotzsky’s, which has more than 400 franchised and company-owned locations around the world, has joined the craze, revamping its menu to add four varieties of artisan flatbread. Customers can choose from the California Chicken and Avocado, Chicken Chipotle Pesto, Margherita, and Italian Sausage and Basil, which are each served on a wooden pizza paddle and made with fresh ingredients. Each artisan flatbread dish is $7.49. Mundle says it’s the individualized sauces that set their flatbreads apart from the rest, such as on the California Chicken and Avocado, which has an Andouille white cream sauce with roasted chicken breast, chopped bacon, diced avocado, fresh red bell pepper, cilantro, mozzarella and cheddar cheeses, and a southwest chipotle mayo. Another tasty delight is Italian Sausage and Basil topped with the balsamic reduction and thinly sliced Italian sausage, sun-dried tomato pesto, fresh basil, roasted red peppers and tomatoes, and fresh mozzarella and Parmesan cheese. For more information on Schlotzsky’s, call 812-471-4011 or visit schlotzskys.com/menu/. 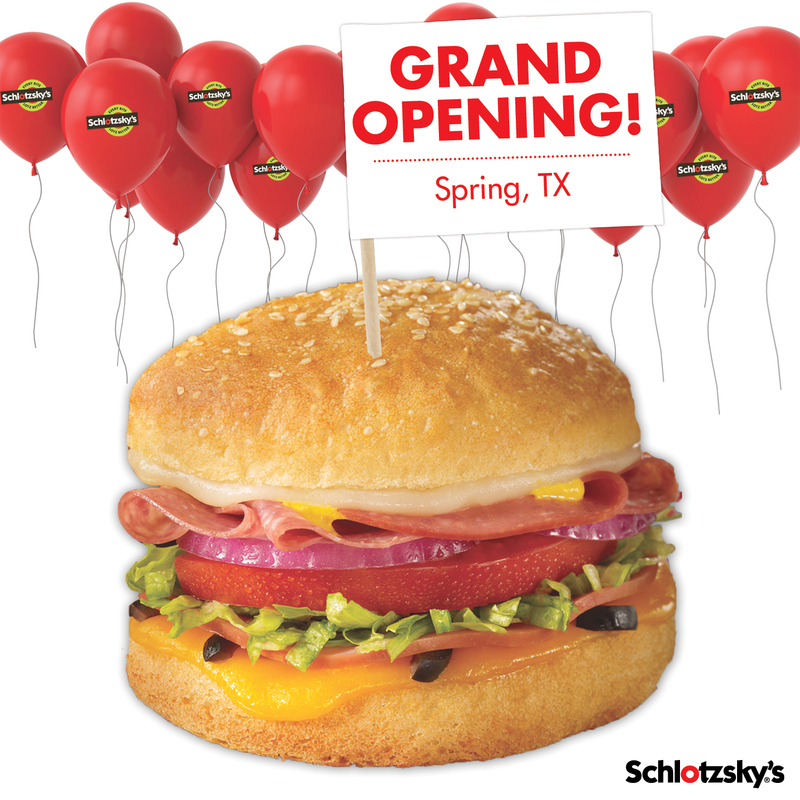 Schlotzsky’s AND Cinnabon are coming to Spring, TX! Grand opening celebrations kick off on Thursday, May 1. The fun starts with a ribbon cutting ceremony at 10am followed by games, prizes and more. The first 50 people to purchase a Cinnabon 6-Pack will get FREE Schlotzsky’s every week for a year! Join the Schlotzsky’s Bun & Fun eClub on opening day and you’ll be entered to win two round trip airline tickets to anywhere in the continental US! TCBY at Schlotzsky’s! Grand opening event on Sat., April 19! TCBY is now at Schlotzsky’s! Visit any of the locations listed above on April 19 from 2-6pm for sweet treats and fun prizes! The first 50 people to purchase a TCBY treat get FREE Schlotzsky’s for one year! Bring the whole family! *Minimum $5 TCBY purchase to be made after 2pm in-store only. Valid only at locations above. Free sandwich offer valid for persons 18 years or older. 52 small The Original sandwiches; one sandwich each week for a year beginning April 19, 2014 and ending April 18, 2015.